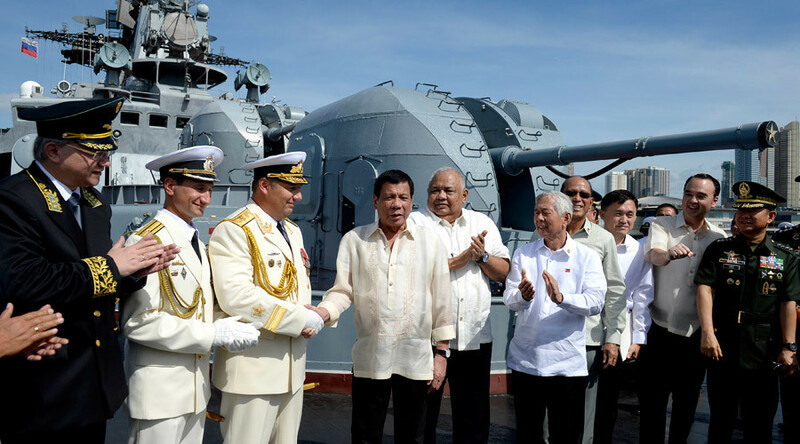 Philippines President Rodrigo Duterte visited the Russian warship Admiral Tributs, one of two currently docked in Manila. The move is another sign of warming relations amid the Philippines’ spat with decades-long ally, the US. Duterte boarded the ship Friday afternoon, where he was welcomed by the Russian Navy and Ambassador Igor Khovaev. “We welcome our Russian friends. Anytime you want to dock here for anything, for play, for replenish supplies or maybe our ally to protect us,” Duterte said as cited by Reuters. He then shook hands with Rear Admiral Eduard Mikhailov, who heads the Russian Navy’s Pacific Fleet. 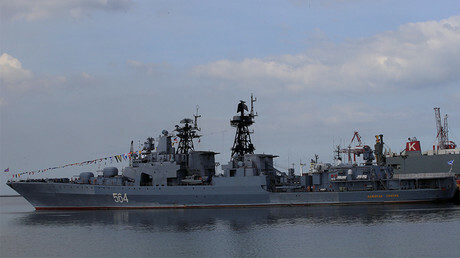 Khovaev told a Wednesday news briefing that Moscow is willing to help Manila advance its military capabilities in the interest of mutual cooperation and enhancement. He warned that the relationship between the two partners is their business alone, but downplayed comments that the Philippines was getting friendlier with Moscow as a tactic to anger the US. “I think it’s time to get rid of outdated clichés. It’s time to get rid of prejudices. As far I understand the Philippines, there is an objective need to diversify the range of circle of your foreign partners,” the Russian ambassador said. This is the first meeting of the two navies, and it comes less than a month after the firebrand Philippines president sent his foreign and defense ministers to Moscow to discuss arms deals. This came as a US senator threatened to prevent the sale of 26,000 assault rifles to the Philippines government. Duterte, however, has been making deals with China as well, including one on small arms, as well as a long-term loan and a series of agreements signed on infrastructure. Beijing even gave Manila fishing rights to one of its areas in the disputed South China Sea – something the Chinese were never thought to do lightly. Duterte and Washington have been at odds since the Philippines president took power in June 2016. The United States has been very critical of his war on drugs, raising concerns of human rights abuses amid a flurry of violent shootings in the country. Duterte in return used language that few, if any, heads of state have dared use in recent history, calling US President Barack Obama “a son of a whore,” along with a series of other statements against the Pope and UN Secretary-General Ban Ki-moon. In so doing, Duterte was telling Washington that his war on drugs was none of their business. But it didn’t stop there, as the president quickly began a strategy of alienating the US and inching closer to traditional Washington rivals Beijing and Moscow.